When I met YouTube star Jim Chapman (1.5m subscribers) it wasn't in the usual circumstances for me. But it was usual for him, as he exited a cinema and was immediately surrounded by a hundred fans clutching notebooks and pens or thrusting their phones at him for selfies. When I sent a letter to Carrie Hope Fletcher (500k subscribers) it wasn't until just over a year later that I got a reply, because she receives so much fan-mail it takes her that long to sift through the letters, cards, and gifts. But these people haven't been in movies, they're not famous supermodels, and they're not musicians known worldwide. In fact, if you're an adult you probably haven't heard of them, because they're just normal people like us. Except they've used social media to gain fans and launch careers. YouTube isn't just entertainment anymore. It's a business platform. As YouTubers become more and more popular, with some having a few million subscribers to their name, they're quickly becoming the best advertisers for brands wanting to influence the vulnerable minds of young adults. YouTube stars are making television appearances, posing at movie premieres, accepting international awards, launching beauty and fashion lines, and...well. 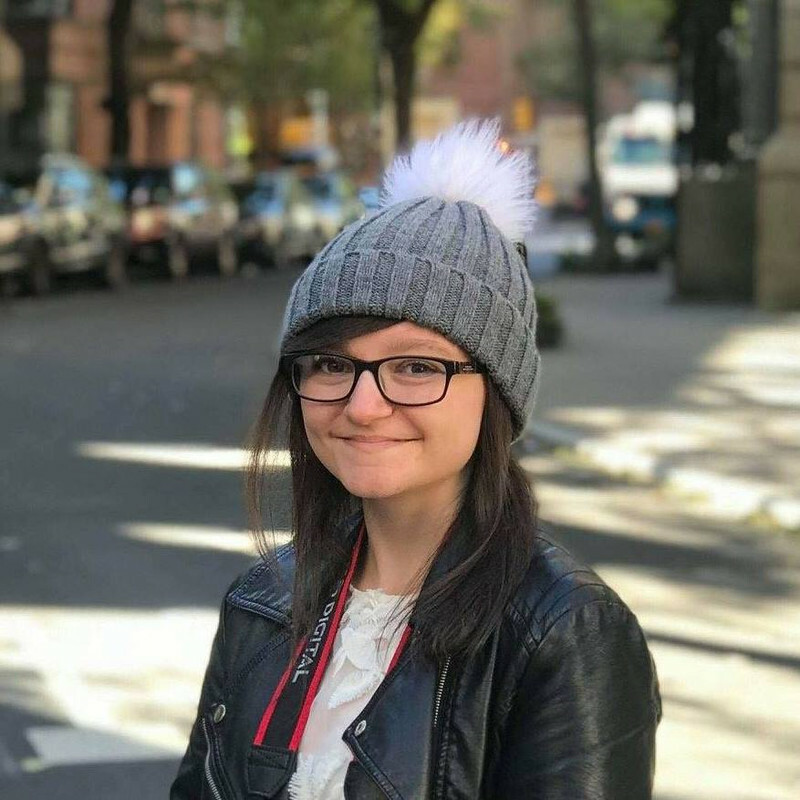 The next step seems to be writing books, as famous YouTubers such as Zoella (5m), Grace Helbig (2m), Carrie Fletcher (500k), Michelle Phan (7m) and more are offered publishing deals. Not long ago it was announced that Carrie Hope Fletcher, who also plays Eponine in Les Mis at the West End, would be writing a book, 'All I Know Now: Wonderings and Reflections on Growing Up Gracefully,' set to be published in May 2015 by Sphere. Around the same time but across the pond, comedy YouTuber Grace Helbig announced her upcoming book, 'Grace's Guide: The Art of Pretending to be a Grown-Up,' which should hopefully be published in October this year by Touchstone Books. Not forgetting beauty guru Michelle Phan's non-fiction cosmetics guide, 'Make Up Your Life,' published by Harmony Books in October this year. This brings me to the most recent and more surprising YouTuber book deal. Zoe Sugg aka Zoella has landed a two-book deal with Penguin, with the first to be released in November. But unlike the others, Zoe's books will be fiction. The first, 'Girl Online,' is about a 15-year-old female blogger who suffers panic attacks. As these get worse, her family whisks her away to New York where she falls in love with guitarist Noah. 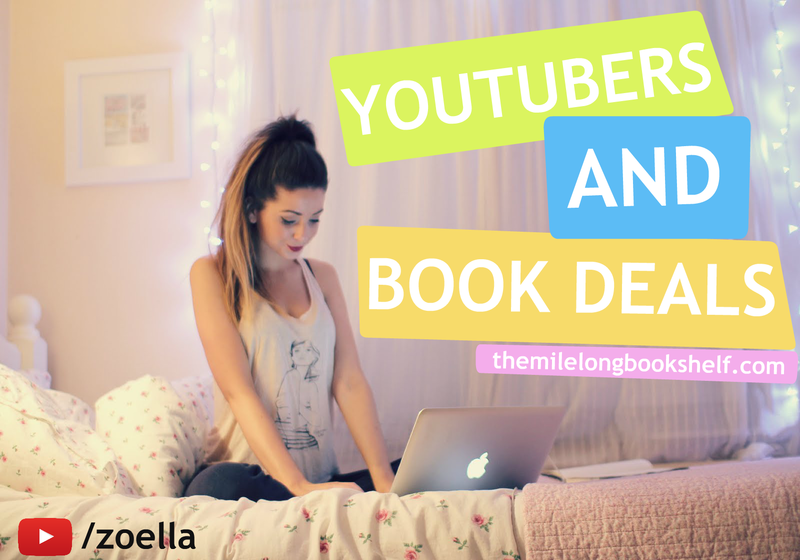 With book deals being offered to famous YouTubers all over the world, outsiders can only assume these will be a great boost for the publishing industry as each star they take on comes with a pre-made multi-million fan base. Some, however, aren't so happy about it, worrying that their chances of being published have been squashed by these book deals seemingly handed to YouTubers on a plate, some of whom had never before expressed a love of writing. Personally, I'm very excited that some of my favourite YouTubers are publishing books - especially Zoe's, which I can already relate to a lot and I've only read the summary! What do you think about this new direction in the bookish industry? I think it makes sense for some of these Youtubers to write non-fiction books. 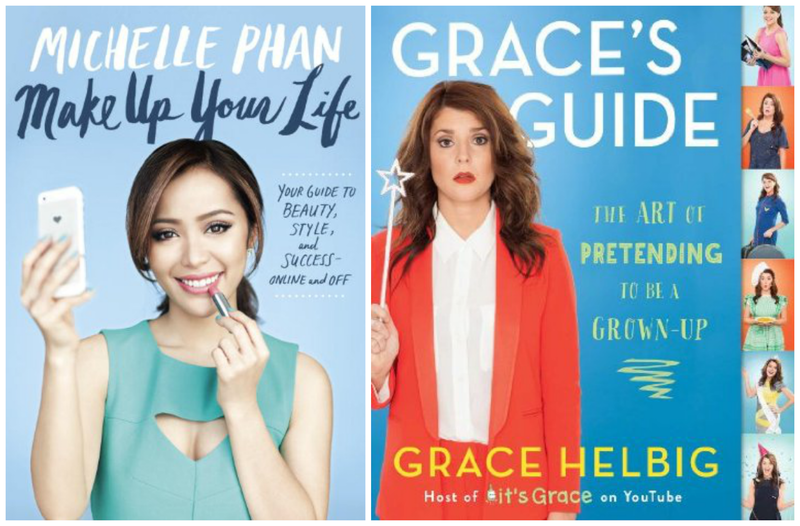 I would definitely read Grace's Guide, but despite by love for Zoella and Jim and all of their friends, Zoe's book deal makes me fearful that it will turn out to be like Tyra Banks' foray into YA fiction. I want it to be great, especially since I also relate to anxiety and panic attacks, but I'm not sure about Youtubers and fiction writing. I haven't read anything by Tyra Banks but from what you just said it sounds like a bit of a disaster...? To be fair, I haven't read it either. It's called Modelland and features a girl named Tookie De La Creme, and is about modeling of course, so it's not something I plan on ever reading, but it sounds....not great. Hmm. I do kinda agree with you. It's cool that they're getting publishing deals so easily, but then again it's not fair to other writers that actually write for a passion. Well hopefully, the bad writers will get weeded out? I love this for so many reasons. As someone who does youtube and as a company who uses youtubers to promote my product. I will admit I have pre-ordered both Grace and Zoella's books already and with the recent amount of Bloggers getting book deals I only imagine their will be more. However, I will admit I don't have crazy high hopes that they will be AMAZING. With that being said.... how did you meet Jim? Do you live in Norwich? Lucky Duck! I think Carrie's will be good because she reads all the time, and maybe Zoe's will be too because she's wanted to be an author from 14 and has written a lot before. But the others...they never expressed a love of writing. So we'll see. I, personally, love the fact that you tubers are starting to write books. Then, not only can you watch them but you can have a personal piece of their work on your shelf, which feels great to me as a huge fan of you tubers especially Zoe and Carrie Hope Fletcher. I can't wait until their book releases. I don't think having you tubers write books will make it any difficult to write your own. It's still the same business that they had to break into, just like any aspiring authors have to try and break into. They just had a little boost through YouTube, but if you think about it. They also had to work very hard to get recognised on YouTube too. So I actually think this is a positive direction for them. im not sure how i feel about it, but im sure ill read the book onces it out..
To be fair it's not uncommon for bloggers to write books in their niche - the best ones are considered to be experts in their field and the blog will help to sell the book so I'm not surprised that it's crossed over into vlogging too and I'm all for that. Acturl like the idea Vloggers write books but aslo is on fair and reason it good because prmotes reading a bit more , but write suppse be a passion and not for money. I completely agree, so hopefully they're doing it for the right reasons and not just for money. And with all their fans they'll be getting non-readers to read books, which is great! This was a really good post. I didn't even know about any of this ... I've heard of one of those youtubers but unfortunately don't watch any so that's probably why these books weren't on my radar! I'm a little mixed... Overall though I love that youtubers who reach so, so many people online are releasing books. Mainly because it boosts the publishing industry so much, brings in so much more money for the industry, etc. And of course it's likely that people who don't normally read will read their idol's book and then discover similar ones, and consequently they're reading more. I wrote a discussion post on that a while ago - on how celebrities help the publishing industry and help encourage reading. It's a really interesting topic that's divided a lot of people, I think! Thank you! To be honest, the books haven't seemed to receive a ton of publicity...yet. They've mainly just been mentioned in videos and in a couple of newspaper articles but I expect there will be more promo nearer the publication dates. I was mixed when I heard about Zoe's book. I'll read it, without a shadow of a doubt, but I do feel they're kind of 'sponging' off their fans, and getting all the money out of them that they can. Then again, anything that gets people reading, especially if they have the fan base that Zoe has, which is generally to do with fashion and beauty, I'm all for it, I just feel like the publishing world is missing out on some really great talent - because reality is, if Zoe wasn't a famous youtuber, there is no way she would have this book deal. Absolutely no way. So it seems a little unjust. I do feel like that with some of them, like Grace Helbig and Michelle Phan. I'm a fan of both but they're the ones who don't seem that into the bookish world, if you know what I mean. I think it just makes sense. When you say "YouTube isn't just entertainment anymore. It's a business platform. ", you are actually defining how the internet works nowadays. I'm active on the web since before the concept of blog existed, not to mention book blogging, or any other form of 'niche' blogging, and I can say that I saw this coming. So, it doesn't surprise me much that YouTubers are getting great deals or are being treated as celebrities. I also don't have anything against them becoming famous (well, more famous) and getting book deals. The only thing I wonder, but that's certainly not limited to YouTubers or to a certain blog niche and it extends to all the blogging community, is if these people are getting book deals because they actually are skilled authors/writers or just because that's "what sells at the moment". I believe that everyone has to find their real talent and go with it, but if these YouTubers are multi-skilled people good at everything they do, then who am I to complain they are getting their book(s) published? You're right, it does make sense. I also wonder if they're actually skilled or if they're just being approached because they're already famous with the target market. Apparently Zoella wrote a novel when she was 14, so she's always loved writing, but is she good? She was approached by Penguin because they liked her blog, but that's different from actual fiction writing... I suppose we'll see when the book comes out. I hope you don't think I was complaining about them by the way. I'm a big fan so very excited and happy for them, but it's difficult in that industry to see what's genuine and what isn't. I think it will be an interesting twist to the publishing industry. It's amazing that these people have been able to create careers for themselves online. It will definitely change the publishing world, maybe for the good, maybe not. I'm inclined to think it will be for the better; YouTube and the internet in general is another way for authors, artists, whatever, to get their medium seen and acknowledged. More often than not, they are working on projects they are passionate about. OHHHH. I don't know how I feel about this. I've been following the likes of Zoella, JuicyStar07 (Blair Fowler) etc. for quite a few years, I'm pretty sure I've been there since close to the start with a lot of them, 2007/2008?? I've purchased from Blair's online store quite a few years ago (a personalised makeup brush holder if anyone is wondering...) and always thought the Fowler girls were pretty ingenius to be making the career out of it that they did. I think on some level I do get a bit uptight when it comes to publisher deals being handed out to people who have never shown an interest in writing a book, but then that's hardly fair - anyone with a strong following and semi-celebrity status will be offered the opportunity to promote and sell, so why not YouTubers? It just grates me that so many amazing stories aren't published by people who slave away at this as their PASSION, their JOB, and then it gets handed to some others so easily, who are perhaps less deserving. But since when was life fair??? The YouTube Celeb is something that's very new though and has seriously taken off in recent years, I dread to think what some of the bigger "stars" are earning (some warranted, some not-so-much!). I never really thought of them (the youtubers) as any type of celebrity until recently actually, when you posted the video of The Divergent launch day and people were screaming and trying to get to Jim to get autographs. At that point I remember thinking, "Huh, when the hell did this happen?!" Maybe I just don't get starstruck easily, but I don't really get the "celeb" status going on at the minute - which is a contributing factor in the publishing deals. It will be interesting to see if ghost writers are involved, and what the quality of the finished product is like. Fair play to them though, it's forging a career for yourself in the digital age that I don't think anyone saw coming. I have personally never heard of these people (cries about how out of it I am). I do think though we have to be wary. Are these people really writing their own books or are they ghost writers? I feel that it is unfair to other people who write their books then go to agents and publishing houses before they finally get a book deal. These are youtubers not writers. I feel like this is encroaching on the rest of the publishing industry, but then again I don't know any of these people. I absolutely love Zoella and have been a subscriber since 2010. I was so happy to hear she is writing a book but I also feel like it's not fair on writers who have been trying to get their book published. Zoella was handed a publishing deal based on the style of her blog, but that doesn't mean that she may be able to write books. I like how she is publishing a book but I would have liked it if she went through the way that most writers go rather than being handed a publishing deal because of how well known she is. It's not really fair. BUT I really do like Zoella and love that she is writing a book on a character that has anxiety and it sheds more light on anxiety and panic attacks. I always have mixed feelings when I see people who are famous or well-known receive publishing deals. And sometimes, it's not just a simple one book deal, instead there are six-figure advances involved. There are may positive things about people like Zoella writing a book, though! Finally, since she has experienced anxiety on such a personal level, she'll be able to write an honest account for a lot of young girls also suffering to read. AND, reluctant readers may also pick her novel up! If one thing is for sure, I'll be reading it! I just got done reading Grace's Guide and was very impressed. I love Grace and the book perfectly portrays her personality. I can't wait until I buy my next one (which will probably be Mamrie Hart's).